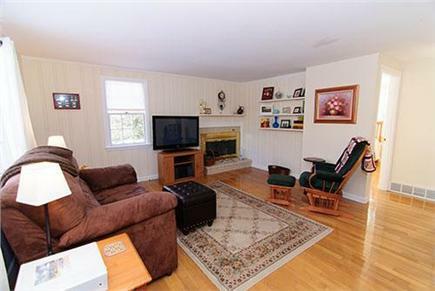 Enjoy this comfortable and clean year round home in a quiet neighborhood within walking distance (4/10 mile) to Seymour Pond (fresh water) in Brewster. 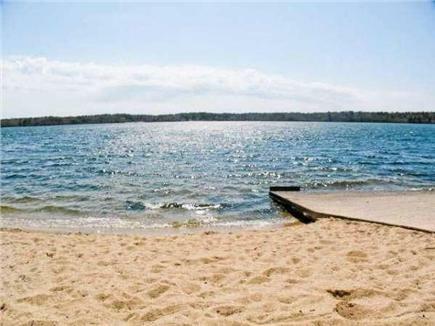 Includes full access to a private association beach & small dock. Includes use of (2)2 person kayaks, beach cart, sand chairs and sand toys. Bike to the Cape Cod Rail Trail (3/10 mile, across Rte 124 to pick up path) for access to 4 Brewster ponds or to General Store. This 4 bedroom, 2 bathroom (sleeps 8) home boasts approximately 2,000 square feet of living space, hard wood floors throughout and includes central A/C. The first floor has a bright and open floor plan, with a first floor master bedroom (queen size bed), a full bathroom, full kitchen with separate dining room, family room as well as an additional living room. Full kitchen has stainless steel appliances, cherry wood butcher block counter tops, antique workbench island and breakfast bar with 4 stools. 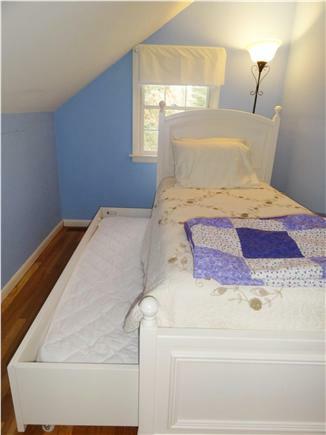 The second floor has 3 bedrooms with a full bathroom. Enjoy the private back yard with a partially shaded patio, large stone patio with lounge chairs, dinning table with umbrella, an outdoor(hot & cold) shower, as well as an outdoor gas grill with a side burner. The 400+ square foot family room has a 52'' flat screen HDTV with cable and a DVD player along with assorted DVD's, and a radio. The family room has a children's section kids table & chairs, toys and books (legos, match box cars, barbies, baby dolls, cards, assorted games and puzzles). The living room has a 42'' flat screen TV with cable and a DVD player. The home has high speed wireless internet connection. 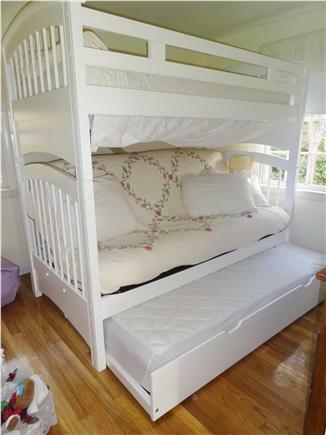 The home also includes a queen size pull out sofa, 2 crib mattresses, one portable twin mattress, a pack n' play, high chair, stroller, infant bounce chair and child safety gate. Kitchen includes all major appliances including dishwasher, microwave, butcher block island, microwave popcorn maker, crock pot, Keurig , as well as a coffee pot & tea kettle, blender, toaster, waffle iron, electric hand mixer, bar tools (shaker, corkscrew, etc) and a washer and dryer in basement. We supply a variety of children's toys, books and dvd's. We also supply beach accessories such as sand toys, boogie boards, sand chairs, 1 beach cart, and 1 small and 1 large cooler. Home has back yard service for trash and recycling. Additional pricing info: Weekend stays are welcome in the off season. Contact owner for rates and availability. State and local taxes of 14.45% will apply. 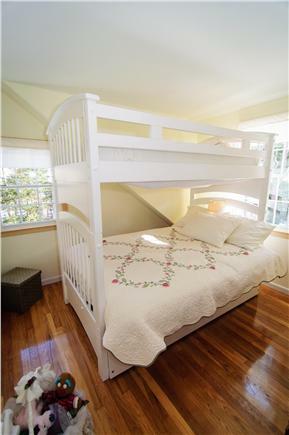 This house is beautiful and has all the amenities and more to make sure your Cape vacation stay is enjoyable. The kayaking is so much fun and the lake is beautiful! We love the back yard and the fire pit. Very nice patio, and our family had some nice cookouts and dinner on the patio. We would highly recommend this property. 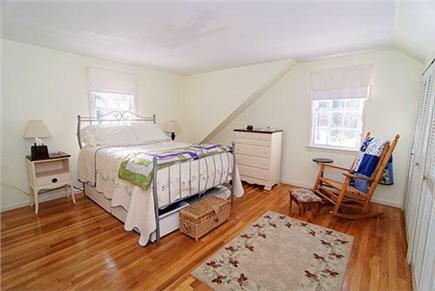 We had a wonderful stay at this Cape house in Brewster. The amenities were fantastic! With 2 teenagers and friends and family who stayed with us during the week, there was plenty to do and lots of space in this Cape style home. As an active family, we enjoyed the short walk to Seymour Pond which had kayaks and paddle board to use in the in the scenic Brewster/Harwich pond. We enjoyed sitting by the private beach or kayaking over to the public area at Seymour Pond by the bike path stop. The Rail Trail bike path, was right down the street with a convenient access bridge to the path. The Bay beaches are very close with our favorite being Paine's Creek, to hit as the tide starts going out so the kids can ride the current on the Boogie Boards (provided at the house). Kate's Seafood was our favorite stop after the Beach for a quick bite and ice cream. We had the pleasure of staying here in August 2016 for 7 days. The house was in great shape and included a lot of amenities that made our trip better. Having up to 6 people in the house at one time, we never felt cramped, lots of room and things to do. The fire pit made for a fun end to the day for the family. Would definitely recommend this place to anyone, plus the owners were a pleasure to work with. We had an excellent family vacation at this property. Plenty of room for guests from TX, KS and MA. 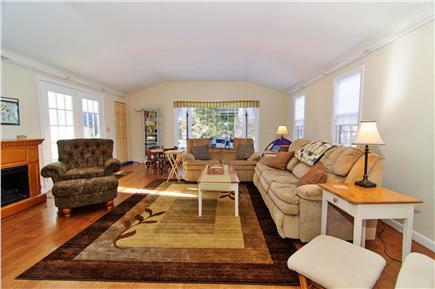 Spacious with two separate living rooms and fully equipped for ALL ages! The location was perfect. Very clean and comfortable. Perfect house for our family vacation. They supply everything needed for all ages. Plenty of bikes, boogie boards, kayaks and life preservers! The outside patio area is gorgeous and a great place to hang out on the beautiful Cape evenings. 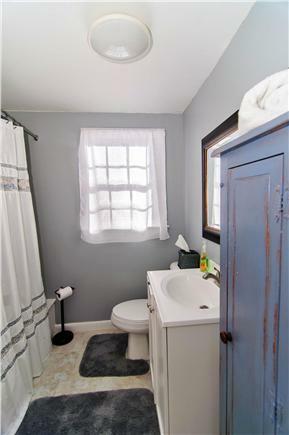 The house is very clean and in a great location. 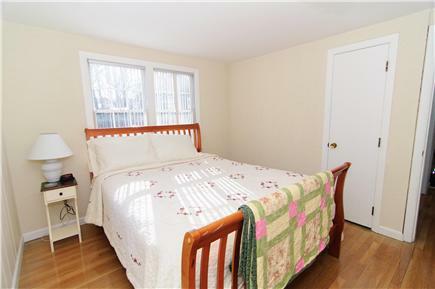 Walking distance to beautiful ponds and just a short distance to bay beaches. The Cape Cod rail trail is right down the street, which was a big plus for my family. Spent a weekend there and the house has everything you could ask for. We took advantage of the activities that are nearby and when we returned, it was great to relax at such a nice place. We just returned from staying here for a week & we loved it & will likely stay here again! The property location is perfect as I have four kids & we could easily walk to the lake & it was just a short ride to go to the ocean. We also loved the Cape Cod Rail Trail & walking to get ice cream at the general store. We slipped away for a girls weekend. My first time on the Cape! The house feels like home, we wanted for nothing. Plenty of room to sprawl out and relax. We loved the outdoor shower! The smell of flowers fills the beautiful breeze. The home is nestled in a beautiful neighborhood. I love that you can take a quiet walk and hear the birds chirping, or hit the bike trail and have an adventure. I can't wait to come back! I spent a quiet weekend in this lovely, beautifully appointed home. A comfortable living space with many thoughtful amenities. 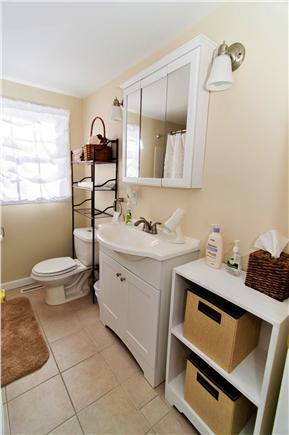 Great location walkable to the pond and bike and to other fun locations. I can't wait to rent it for a week in the summer! 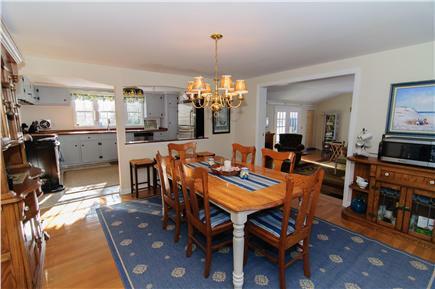 My husband and I bought our Brewster home in 2011. 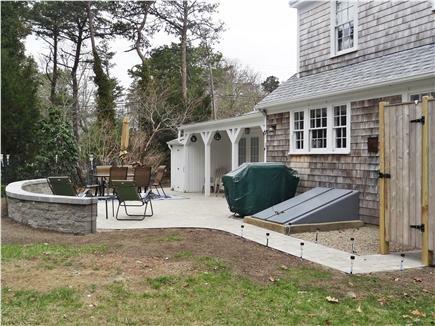 We have vacationed at the Cape since college and always dreamed of owning our own cape home. We fell in love with this home and have worked hard to make it a great home away from home for our guests as well as our family. It is truly a home away from home. 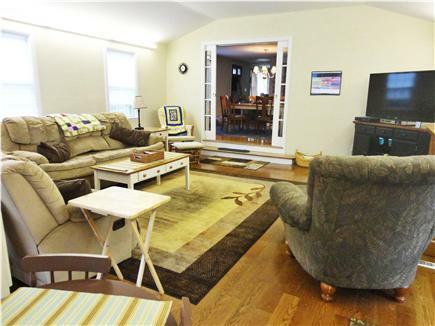 We have included toys, games, puzzles and a Nintendo wii in the large family room to keep the kids busy. We have a stroller, high chair and pack n play. We have stocked all the usual sand and beach toys and chairs so you dont have to worry about loading the car. Our outdoor patio and private back yard with fire pit means you can relax at the end of the day. 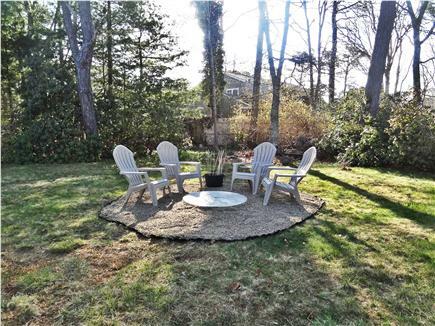 We are located in a quiet association neighborhood that is right on Seymour pond with a beach and dock just for the association. There are 2 kayaks for your use on the large pond. The bike trail is right down the street for biking and jogging. 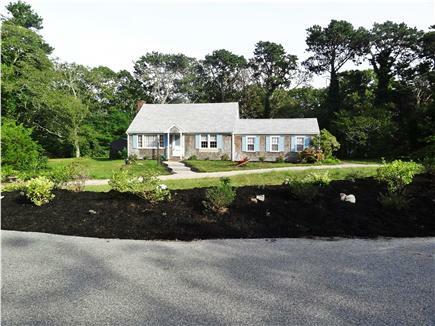 With a quick 3 mile drive to the Bay beaches and convenient access to Rt.6 makes it easy to enjoy bay, sound and ocean beaches. Our home makes it easy to enjoy all the Cape has to offer without all the driving and traffic.